Selenium is an open-source tool for automating browser-based applications. Selenium scripts test your website by simulating user behavior – they navigate through web pages, click links, submit forms, and verify that the expected text or elements are present on the pages. AlertSite Enterprise lets you use Selenium scripts to ensure your critical business transactions are working correctly. 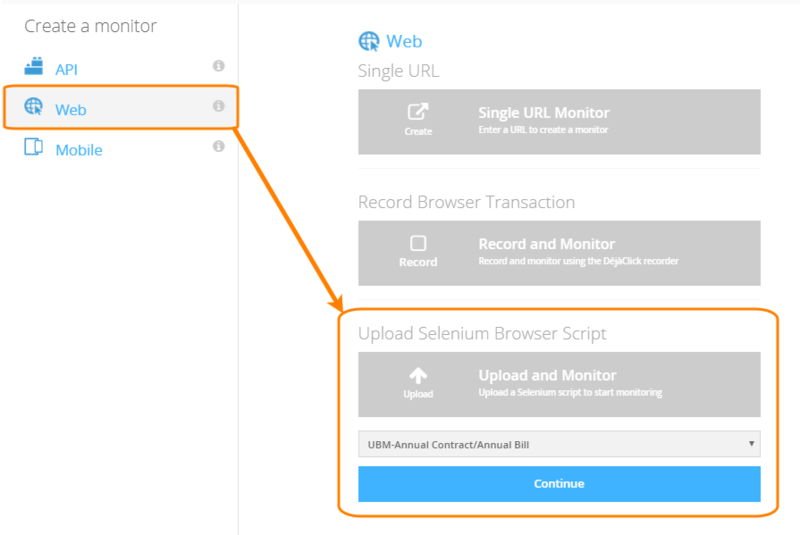 You can upload Selenium scripts and run them from AlertSite global monitoring locations, measuring the transaction response time. Selenium scripts run in real browsers – Chrome and Firefox – so they accurately model real user experience. Selenium 2.x (WebDriver) scripts written in Java using the JUnit framework. If you use Selenium IDE to record scripts, it has an option to export scripts to the Java JUnit format. Note: The browser to use is specified in the Selenium script. Web drivers: ChromeDriver (recommended), FirefoxDriver*, MarionetteDriver*. Framework: You can use the JUnit framework to write your Selenium tests, or you can write your own simple main() function. Screen size: 1280×1024 is the default browser window size at AlertSite monitoring locations. * Firefox support is in beta and there are some known issues. Selenium 1.0 (RC) and Selenium Grid are not supported. Note: Selenium monitors are full-page monitors and consume usage credits at the fullpage rate. Private locations support Selenium monitoring starting from Private Node Server v. 2.0. A firewall rule may be required to allow download of your Selenium scripts from the AlertSite platform to your private locations (see Network Connectivity). It is easy to reuse your Selenium scripts written in Java to create AlertSite monitors. All you need to do is to add two small code snippets into your working Java code, then export your project as a runnable JAR file. Before you upload it to AlertSite, make sure it is played back successfully on your computer. See also Guidelines for Selenium Scripts. On the Dashboard, hover over + Add New and select Monitorn. Select Web and click Upload and Monitor. If you have multiple AlertSite plans, select the plan to be used for this monitor. Note: If you have the VM Node plan (monitoring from private locations only), make sure you use Private Node Server 2.0, because earlier versions do not support Selenium. Browse for your JAR file and click Submit. Name your monitor and select the run interval (the default value is 5 minutes). On the next screen, you can run a test on demand to verify your JAR file. This is required only if your Selenium monitor will run from AlertSite global locations. If you selected the VM Node plan for your monitor, skip this test. Click Test on Demand. AlertSite will run your script from one of its locations. If everything is OK, you will see “Test completed successfully”. If the test fails with an error, you need to fix the error in your Selenium script and upload a new JAR file. 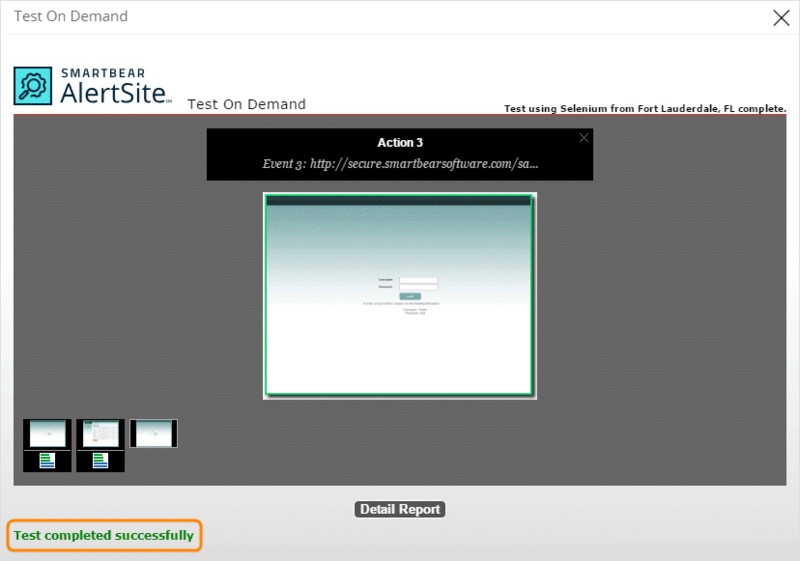 A successful on-demand test is required before you can proceed. When you are ready to continue, click No thanks, I'm done. The next screen is the monitor configuration where you can select locations for the monitor, configure timeouts and other parameters. Note: By default, new Selenium monitors are disabled. You need to enable the monitor manually by selecting the Enable Monitoring check box.. 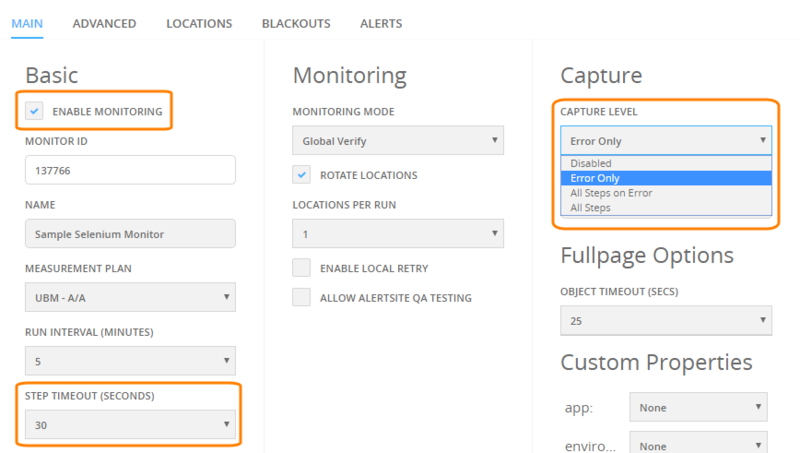 Capture Level – Set this to at least Error Only. This will capture additional information to help troubleshoot errors, such as: web page screenshots, web page’s HTML source code, HTTP request and response headers, and the console output from the JAR file. Step Timeout – Maximum acceptable full-page response time for each web page. This value includes the load time of the page and all of its images, scripts, and other resources. Pages that take longer to load will be indicated in reports. Browser Timeout – Page loading timeout as the maximum waiting time for the DOM Load and Page Load events. The script will be stopped if these events are not received within the timeout interval. This is a per-page timeout. Locations – Select the monitoring locations to run your Selenium script from. Note: Private nodes support Selenium monitors only starting from Private Node Server 2.0. For more information about these and other settings, see Selenium Monitor Settings. From the top menu, select Configure > Selenium Scripts. Click Add a New Script at the upper right. Click Choose File and browse for the JAR file. Transaction Name – The name of the monitor. By default, this is the name of the JAR file you have uploaded. Site Plan – Select the plan to be used for this monitor. Note: For the VM Node plan (monitoring from private locations only), make sure you use Private Node Server 2.0, because earlier versions do not support Selenium. Check Every – Set the monitoring interval. If you are going to run your Selenium monitor from AlertSite global locations, you need to run a test on demand to verify your JAR file. If everything is OK, you should see that “Test completed successfully”. If the test on demand fails with an error, you need to fix the errors in your Selenium script and upload a new JAR file. A successful test on demand is required before you can proceed. Now you can select locations for the monitor, configure timeouts and other parameters. 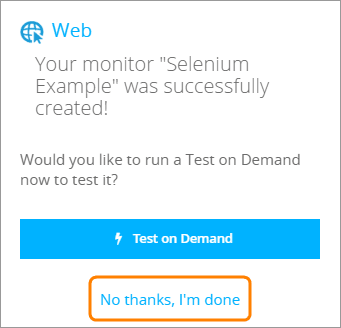 Note: By default, new Selenium monitors are disabled. You need to enable the monitor manually by selecting Enabled from the Monitoring Is drop-down list. 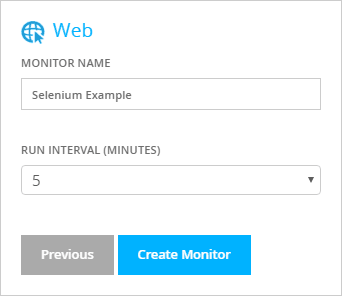 Your Selenium monitor will now run at the configured intervals. The data should appear on AlertSite dashboards in about 5-10 minutes. AlertSite locations have the Firefox and Chrome browsers installed. Each Selenium script begins the run with a clear browser cache. The script launches and closes a browser, navigates to web pages and simulates user actions on the pages. 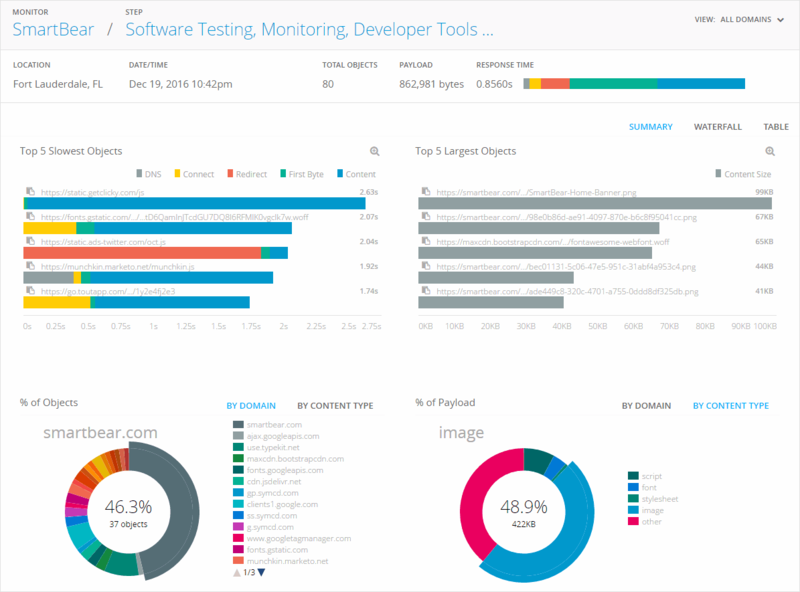 As the script runs, AlertSite tracks which pages are opened and measures the response time for each web page. Individual pages are reported as monitor steps. The monitor status in AlertSite is determined by the exit code of the JAR file rather than the status of individual web pages. The JAR file must return status 0 if all tests were successful and a status > 0 on error, as shown here. This means that if an error occurred during the script (for example, a page could not be loaded), but the script returned exit code 0, the monitor status will be OK. 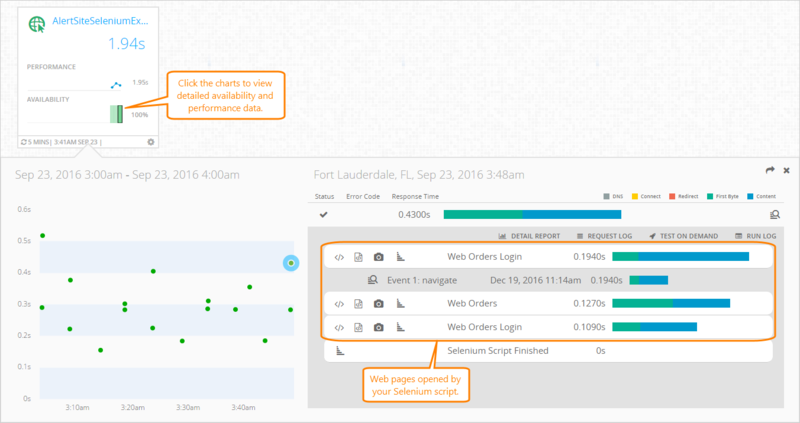 Page errors (like HTTP errors or loading timeouts) are indicated in the monitor run details and in reports, but do not affect the monitor status and your SLA metrics. 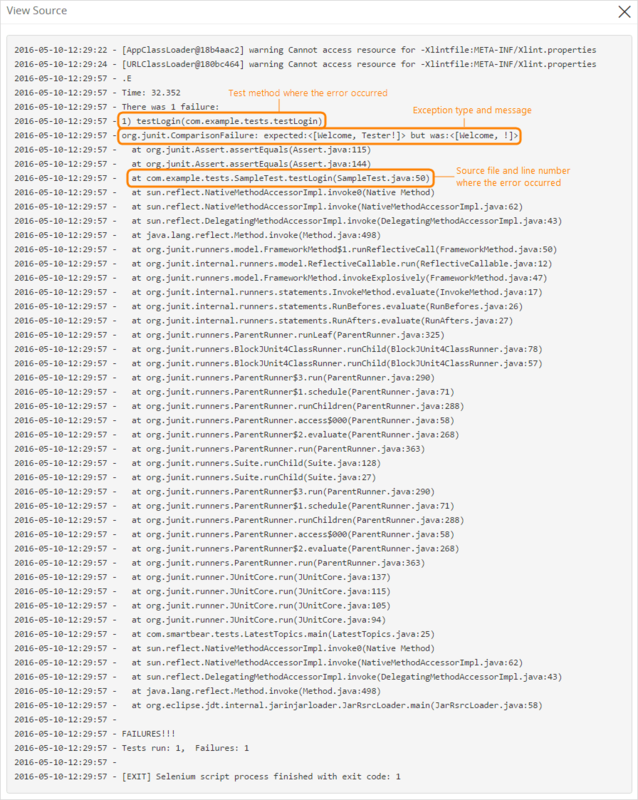 AlertSite does not specifically track the status of JUnit test cases (@Test methods) in your JAR file, but you may be able to see this information in the run log. The list of all web pages opened by the script. Pages are represented as monitor steps. The response time for each page and page assets, including the DNS time, connect time, DOM Load, full page response time (page and all page assets), and other metrics. The status of each page and page asset: OK, HTTP error, or response time exceeded the timeout. Waterfall charts for each page. Run log containing the console output from the JAR file (to help troubleshoot errors). Clicking next to individual pages in test run results opens the Run View with waterfall charts and content breakdown. Here you can see the slowest and largest objects that affect your web page response time. AlertSite can save the console output from Selenium monitors to help with troubleshoot monitor status 20 “Selenium-specific error”. The monitor needs to have the Capture Level option set to enable this. The console output will be available as the Run Log in the monitor run results. Custom messages logged by System.out.println() in your Selenium Java code. You can use this to annotate the script execution progress. 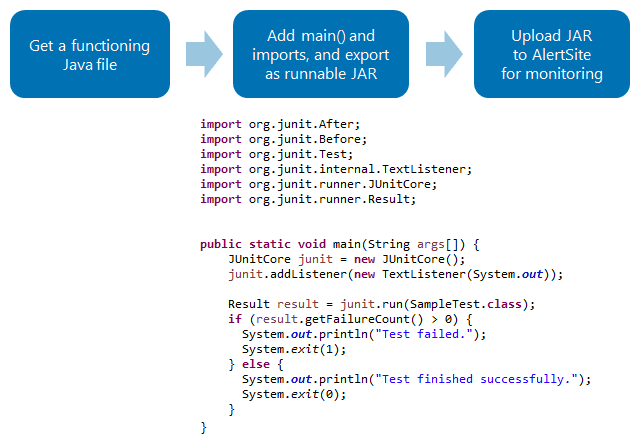 Output produced by the JUnit framework (if you created your Selenium script using JUnit). This typically includes error details such as the name of the failed test method, the error message and the exact line number in the Selenium script where the error occurred. If you followed the tutorial to create a JAR file, this is already done. If not, add this line (see the recommended main() method code for an example). You can also have this log attached to email alerts. To do this, select the Attach server response to email alerts option for your email alert recipients. DNS failures halt the execution, causing monitor status 20. However, expanded runs on the Monitor Runs dashboard and the Detail report do indicate the DNS error (status 51) for the corresponding URLs. Connection timeout causes the browser to hang and is reported as status 95. Occasionally, page screenshots and timings are missing from the Firefox replay. This is because the Marionette driver does not wait for the page load to complete before proceeding to the next event, so AlertSite may not be able to capture performance data at times. You can ignore these warnings. They do not affect the functionality of your Selenium scripts.